During the 2017 / 2018 trade show season I traveled around the globe presenting my seminar “Dog Grooming Simplified”. 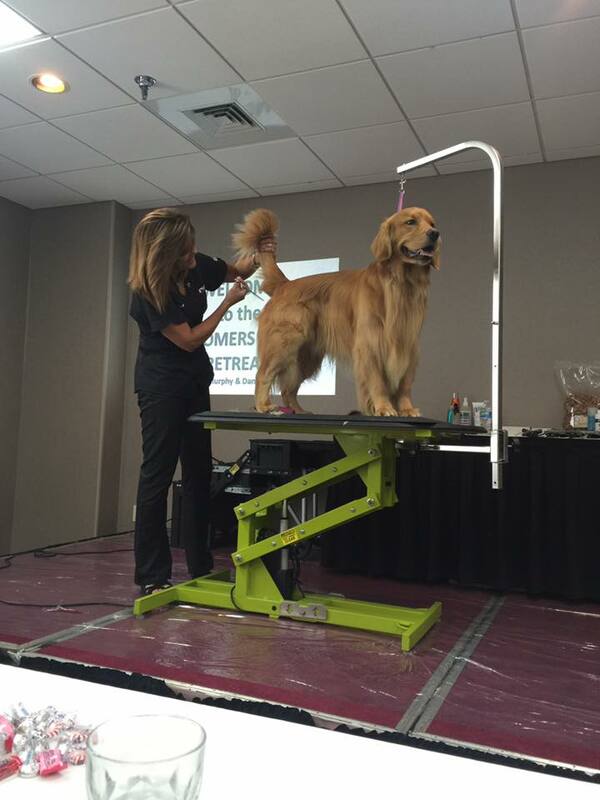 This seminar was very much an oral and visual presentation of many of the concepts and techniques in my book, Dog Grooming Simplified. I discussed how important it is to understand basic canine structure in order to achieve a well-balanced, stylized pet/show trim on pure breed dogs as well as grooming mixed breed dogs. All dogs have the same bone structure so following certain reference points makes it a breeze when placing patterns correctly. Over the course of this two year period, groomers across the globe expressed how much this seminar has helped them with their grooming skills. Knowing that I can only do so many seminars, and that not everyone is able to join me live in person, I decided to put this information on video making it the ultimate compliment to my book. Dog Grooming Simplified breaks down the breeds by pattern similarity, unlike any other grooming books. It is amazing how many breeds are groomed in the same fashion. The pattern groups are categorized by “Setter-like” pattern, “Terrier-like” pattern and “Sculpted Body Trims”. In this video series you will see these patterns demonstrated on a Scotty, Airedale, English Cocker Spaniel, Poodle and Bichon. how much my seminars have helped them. So I decided to put this information on video making it the ultimate compliment to my book! DGS uses photos of some of the top show dogs in the country which are the finest representation of their breed. This gives the groomer a vision of what the breeds should look like. It also gives a clear vision of the coat length as well as the overall trim in its entirety. This is how I taught myself to groom, by looking at photos of show dogs as well as attending dog shows to see what the breeds should look like. I tried to mimic the show trim using pet grooming techniques. My business took off like wild fire and people kept coming back for more! That’s when I knew I was on the right track with my skills, and that’s why I chose to use photos in my book! Once the groomer understands correct pattern placement, it can easily be applied to any pet trim and/or mixed breed. Also covered in the Dog Grooming Simplified Video, are Round Heads, Rectangular Heads and Sporting Dog Heads, as categorized in the book. There are so many breeds that are shown in full coat in the dog show ring like the Shih Tzu, Maltese and Yorkshire Terrier to name a few. As groomers, what do we do with these breeds? There are no directions! This is where we can become creative and place different breed patterns on these dogs. Why not groom a Cockapoo to look like a Wheaten? Or a Maltese to look like a Setter? You will see these examples in the “Mixing It Up” chapter of Dog Grooming Simplified. In the video series you will see a Shih Tzu groomed in a “Terrier-like” pattern. I simplify grooming dogs in this must have video series. This video series along with the book, Dog Grooming Simplified, is a must have for all groomers. For those that want the full immersive experience, I’ve created a bundle which features both the book and DVD video at a special price. Dog Grooming Simplified: Straight to the Point Book + FREE BONUS!